I don’t understand this album at all. This is something of a fallacy for a self-proclaimed music critic to admit, especially for a young one with fairly eclectic taste. Critics are supposed to have the pretense of omniscient knowledge; as far as any reader is aware, a music critic is absolutely in-the-know about every genre of music, has their finger on the pulse of upcoming trends, and uses their vast knowledge to form a constructive opinion about whatever comes across their desk (virtual or otherwise). This seems like an unreasonable thing to demand from any single person, but is in actuality a completely reasonable expectation to have of someone trying to become even a semi-professional critic. All I know is that I’ve listened to Death Grips’ hotly-anticipated debut studio record The Money Store more than a dozen times over the past week, and rather than try to form the half-baked value judgement expected of me, for once I have to be honest, throw my hands up in the air, and make the disappointing affirmation that “I just don’t know”. Death Grips are a three-piece group consisting of gruff vocalist Stefan Burnett and the production team of Andy Morin and Zach Hill, the drummer of Hella (a band that I’ve grown to quite like). I suppose this is experimental hip-hop, in that Burnett is pseudo- rapping over the electronic beats of Hill and Morin, but it doesn’t really sound like any hip-hop I’ve ever heard. It’s extremely noisy and hectic – parts will repeat as if they’re choruses, but they don’t really have any “hooks” so to speak, and Burnett doesn’t so much rap as he does yell unintelligibly in something resembling rhythm. I suspect that an average listener of mainstream music will actually understand them better than I do; while sonically they’re completely different, they have a similar feel to Das Racist, in that they seem almost like a self-conscious parody of mainstream hip-hop, as well as the “brostep” that pervades modern radio airwaves. 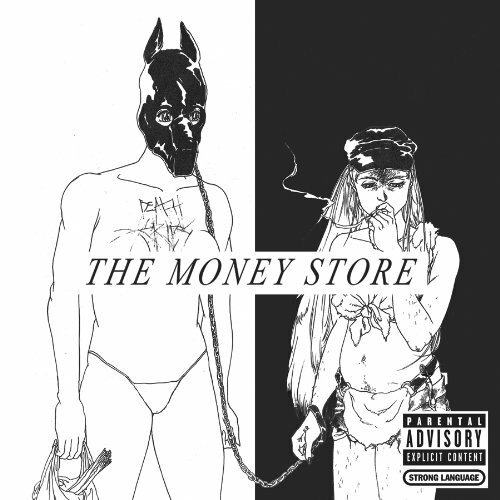 They’re a really fresh, unique band – I can’t really think of anything else that the The Money Store sounds like, other than the drummer of Hella making a hip-hop project. In that respect it’s worth a listen, simply because it’s always worth checking out weird experiments, especially when they’re as heavily-hyped as this one is. But is it good? I honestly have no idea. The more I listen to it, the more I feel like I’m warming up to it, but I don’t know if that’s because I legitimately like it or because I’ve listened to it enough times that the simple feeling of familiarity is pleasing to me. So I’m afraid that this is going to be an album that you just have to listen to and figure out for yourself. But hey – that’s actually pretty cool, right?